We offer engaging and exciting in-school and after-school programs which include engineering, robotics, coding, Minecraft, outdoor design, and much more! Our Mobile STEM Lab will come to your school! These are the workshops we commonly run, but we teach many other programs. Give us a theme and we'll brainstorm something! About: Not all movies need a big budget! With the use of only a few simple items and students' creative minds, we can delve into the world of videography and create some incredible stop motion animation movies utilizing the program SAM. Let legos dance, make drawings on a whiteboard move, or have cardboard cutout figures fly through the air! Students will work as a team and become the directors of their very own one-of-a-kind stop motion animation blockbuster! About: Students will delve into the creative process by designing robots that move on their own using only a single motor. They'll have an array of everyday materials to choose from, along with an assortment of gears, in order to create their unique "wiggle bot". The design may or may not work the first time, but that's where engineering comes into play! Students will troubleshoot each other's designs and seek out creative solutions, ensuring all bots are wiggling and drawing by the end! About: Machine autonomy has paved the pathway for lives of ever-increasing convenience. With the creation of a robot that draws on it's own, students can begin to understand the level of engineering that goes into the design of these complex machines, and the behind-the-scenes coding that's required for them to function properly in all manner of conditions. The result will be some wild and fun art projects created by their newly-built machines, and a greater understanding of the intricacies that compose these awesome machines! About: Imperial Walkers from the Star Wars universe, snowmobiles in the north country, and even humans: what do they have in common? They all manage to get around without wheels! 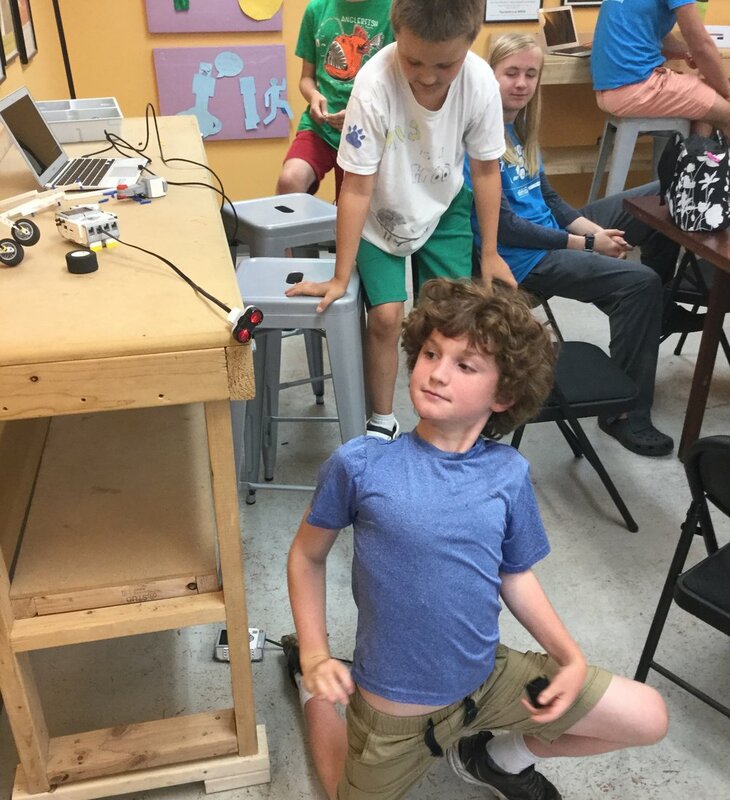 Using EV3 robotics along with a buffet of legos, students will design a lego robot to move--but no wheels allowed! Keeping in mind factors such as how to reduce the friction of a surface, and how the weight distribution of their robot design may impact movement, engineering caps will be affixed to seek out fun and innovative methods of robotic motion. About: Machines make decisions for all of us day in and day out, and it takes an engineer's mind to meticulously design these machines to make our lives that much more convenient. Delving even further into the innovative world of lego robotics, students will use color sensors, touch sensors, and even motion sensors to program even more autonomy into their robot designs. If my robot detects the color yellow, perhaps it should output an image of the sun? About: Bringing robotics into the outdoors opens up a whole new set of engaging challenges. Design workshops include tree climbers who can rescue cats, all terrain vehicles, squirrel cache machines, engaging tag game design with sensors, and so much more! The mixture of technology and the outdoors ensures that, weather permitting, these workshops will engage many different types of Makers. About: Dip into the ever-expanding world of computer programming using Scratch, an introductory programming language. 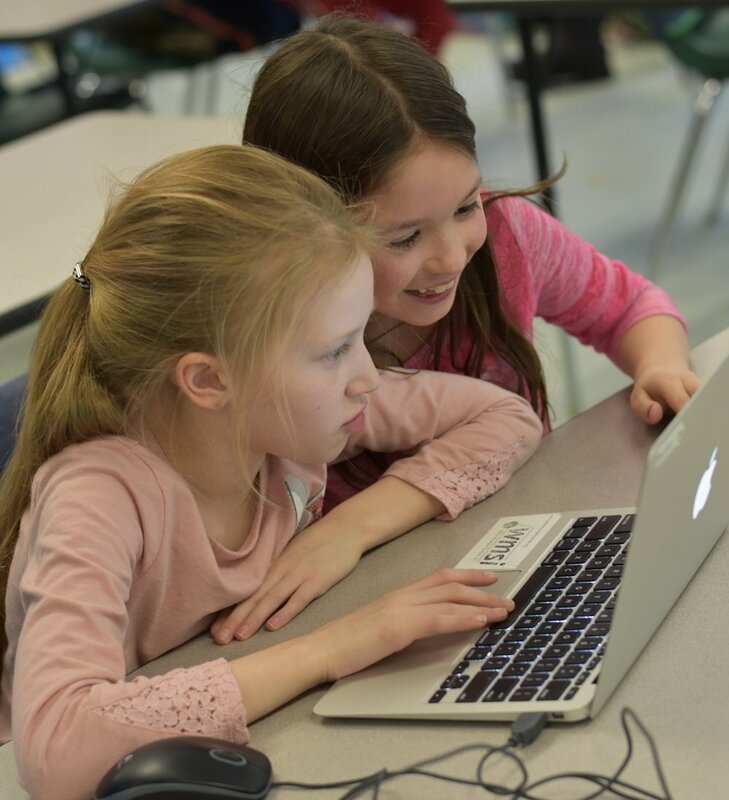 Through this mobile program, students will use this powerful language to design their own computer games, complete with their own characters (sprites), power-ups, obstacles, and mobs! Whether it's navigating to avoid obstacles or creating a multi-level maze game, programming with Scratch will make these games both exciting and educational. In the end, students will have a creative story to tell through the engaging window of their interactive game! About: Have you ever played a video game using a banana as a controller? With Makey Makey, learn just how this incredible feat is possible! Utilizing the principles of electronics and circuitry, students will test the conductivity of a limitless spectrum of everyday materials such as aluminum foil, pencil lead, and even various pieces of fruit. With this wide array of conductors, students will see with their very eyes the flow of electrical signals through a closed circuit that they've designed themselves! About: Using Makey Makey technology, students will have the opportunity to design their very own game controller for a whole spectrum of computer games, including Pacman, Whack-a-mole, Tetris, and Zelda. They'll need to put their engineering caps on, though, as they test the viability of other controllers, and brainstorm just how to improve each other's designs and create the most exciting gaming experience for all! About: Students will learn how to construct their own Raspberry Pi setup with all necessary components, before opening the door to the text-based coding language of Python. After tinkering with simple Python programs, students will use these shortcuts to build larger structures in Minecraft in mere seconds! They'll use these newfound coded shortcuts to create their own custom games in the Minecraft world, having their fellow students test their newly-created games filled with mazes, obstacle courses, moated castles, and more! About: Big-budget movie producers and meteorologists use green screens everyday to make the seemingly impossible come to life! Students will have the opportunity to put themselves into an animated story with the help of this same technology. After grabbing images in front of a green screen, students will insert themselves into a Scratch program, and from there, the sky is the limit with what they can achieve during this exciting creative session! Dance with friends on a stage, shoot a bow and arrow in a forest, and even simulate flight through the clouds before your very eyes! Camp College/Highschool Instructors: WMSI trains highschool and college students to assist with instruction for all of our camps. These instructors gain valuable experience in leadership and group facillitation while also providing mentorship to your children. What a Program Looks Like: In a WMSI program we provide your children with access to resources, hands-on instruction with project based lessons, and a place to brainstorm and create engaging projects. Camps are also designed to get children excited about projects at home, with lots of helpful links and helpful pictures sent to parents at the end of each day!